I've been adopted and am now a treasured, pampered, indoor house rabbit. I even have a hus-bun who adores me! New pictures of Love Dove! She's all healed, very happy and ready to find a special place to call home. We are being especially selective about who gets to adopts her, because we believe that she has the ability to be a humane education ambassador or therapy animal. She is incredibly snuggly and very loving. It's amazing at how far she has come since she arrived at SaveABunny in critical condition on Feb 5, 2011! THANK YOU to everyone who has written to express concern and support for Love Dove. This brave and trusting girl is getting intensive medical care and the love and attention she needs and deserves. She is slowly responding to treatment, but still has a very long road ahead of her. She prefers to spend lot of her time resting her paws on the warm, heat disk we give her twice a day. All her feet are still quite wounded and we are doing our best to keep her feeling comforted. She's not fond of having her feet soaked and lanced, but we do our best to help her understand that she is safe now. We truly believes she understands and her trust in us is helping her healing. Thank you for caring about her and for your donations toward her care. Please don't look away from this page. As hard as it is to see photos like these, this is a real rabbit in need and a real rescue situation. 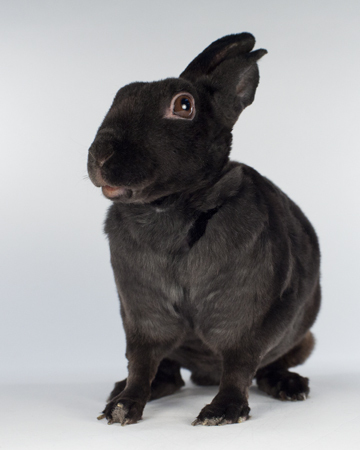 Love Dove is an incredibly sweet,girl who sadly is one of the most severely neglected bunnies we've ever seen. Her condition is very serious and her prognosis is very, very guarded. She came into the San Jose shelter nearly starved to death, infested with fur mites (which caused her to lose her hair) and with massive cuts and abscess wounds on all four feet. The shelter staff saw her will to live and so she came into rescue with us where we can provide her with the medical attention she needs for a chance to live and the love, safety and emotional support she craves. She has already gained much needed weight and is on pain medication, two antibiotics and has been treated for mites. Each day she gets her feet soaked in warn water to help promote healing and then we place soothing salve on her sores. She also gets Reiki and lots of love. Our main concern now is whether the infections in her feet have spread to her bones. If so, she will need to be humanely euthanized, because the only treatment is amputation and all of her feet are infected. We will do everything possible to give her a chance at a long, happy, healthy life. Please help us help Love Dove with a donation toward x-rays and the ongoing veterinary care she will need. Two weeks later...Love Dove is healing!